I overheard a young man excitedly telling an acquaintance he ran into at the store we were in all about this upcoming event he was planning where he was going to use it to propose marriage. He was so excited, so charged up because he would be ring shopping this coming week. Lately the trend of staging an event where the fellow asks his sweetheart to marry him seems to be the in thing to do, so it got me wondering, how do you fellows go about selecting that perfect "STAR" of the event Finale? You know the RING? Having that overheard that conversation and with Christmas being just 67 days away, as well as Christmas also being one of the traditional times of year for marriage proposals and Engagement Announcements, I know you'll be needing to shop for just the perfect engagement ring! 67 days from now will be Christmas Day! Not a long time to shop for that perfect ring which your lady will wear forever, question is do you choose something which suits her physical hand or which physically suits her personality? I found this exquisite Blue Lavender Sapphire Bezel surrounded with White Gold, a very romantic ring set off by the filigree setting from the 1920's. Lavender Sapphires were worn for protection, good fortune and spiritual insight! 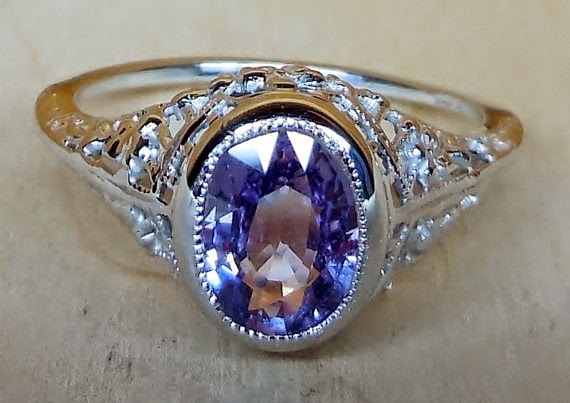 What better to give than the splendor of this romantic Lavender Sapphire! 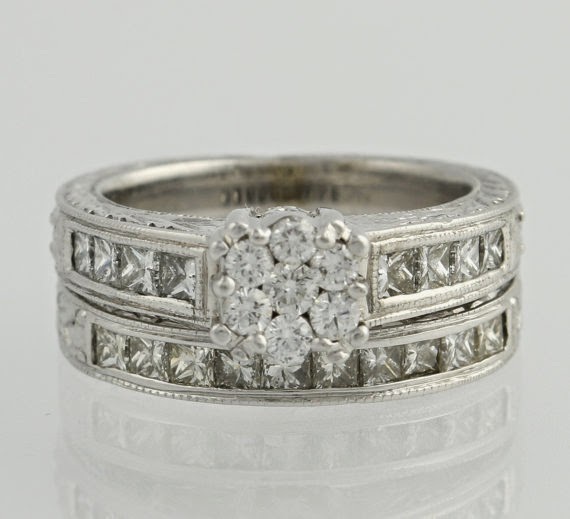 If you go and speak with Amy of DiamondAddiction I just bet your going to find this ring and many more Vintage rings which were superbly crafted in a time long ago when jewelry designers crafted the romance into each ring they designed and made. 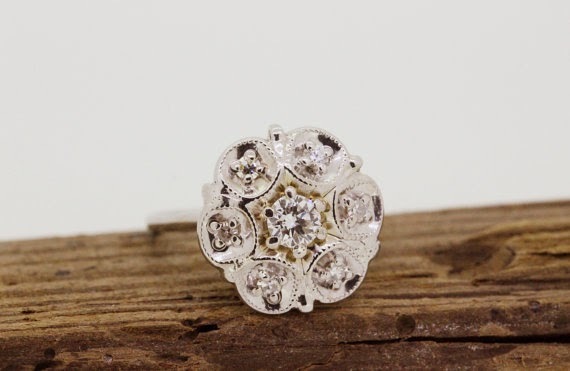 Possibly your a traditionalist and want a diamond rather than a colored gem, then, this Romantic beauty from FergusonsFineJewelry will steal her heart! This exquisite Cluster Diamond ring is not only all diamonds set in White Gold, but it looks like a floral bouquet of forever romance! It takes your breath away! I just bet your not going to see a duplicate of this ring, some possibly similar but not like this unless someone copied it verbatim. One more just to entice you to make finding the perfect engagement ring a priority is this spectacular Diamond I found at WilsonBrothers ! Isn't this just too exquisite? Can you not picture any one of these on your beloved's finger? At Etsy your in for such a welcome treat, it is here you can search from thousands of engagement rings made in an era from long ago, possibly even before you were both born, or, you can find that perfect new ring all without having to make the trek from storefront to storefront in the brick and mortar section of the City or Town your living in! Being that I so love everything Vintage, I have chosen but a few just to show that Etsy Independent shops can really serve the consumer well. Etsy Shop owners are so able to act as Cupid and Santa all at the same time, your sure to be well pleased with your choice and all from relaxing in the privacy of your own space without being distracted. Planning on making this Christmas a very special time of your life, then get busy, the days are quickly counting down to that all important event..